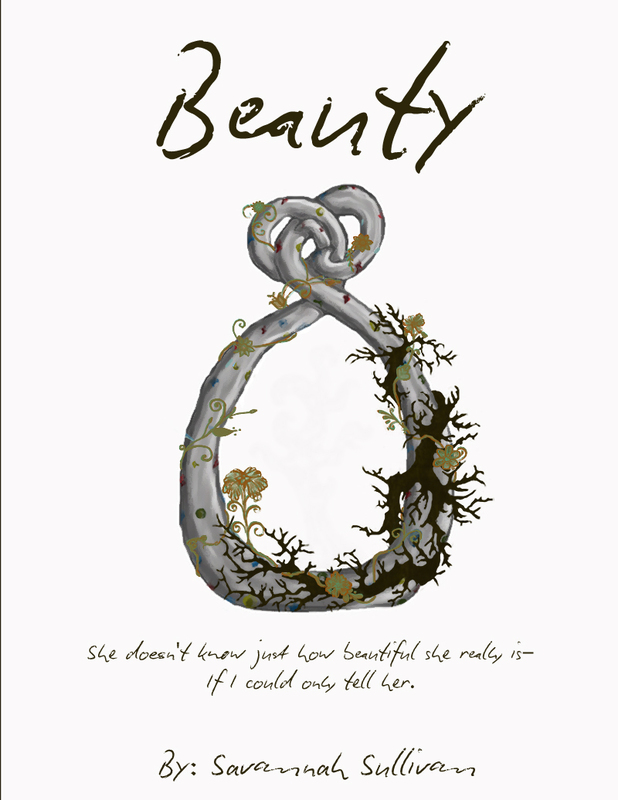 In case you haven’t heard me bubbling about it over the last couple of weeks… I finally finished the first rough draft of my book: Beauty. I had originally thought it would be a short story that I could potentially share over the internet, a glorified blog post. I soon realized that this story had a lot more pages than I felt comfortable sharing over the web, or because of it’s personal message to me, sharing it at all. ‘Beauty’ isn’t just any story. It’s basically a metaphor for what I’ve struggled with my entire life. A couple of years ago I overcame some huge obstacles dealing with low self esteem and self-worth. For the first time in my life I felt beautiful. I no longer considered beautiful as being able look in the mirror and wink at the attractive face/body staring back. I no longer compared myself to others or constantly downed myself in my mind. That’s when I started this book. I knew what it was like to be that girl, who was beautiful in more ways than one but never saw it. I wanted to challenge the reader to examine what they thought beauty meant in a completely non-confrontational way. So I used symbolism. I wedged the inner thoughts of my journey into the story of a girl and a boy, both in search for something beautiful. In a sense, this book mimics certain aspects of my life for the past couple of years. Without spilling my guts all over my keyboard, I will now give a small insight as to why this book is so special to me. I wrote the original relationship between the two main characters out of sheer emotional release from the reality of something similar in my own life. I guess you could call it wishful thinking. Then, as the characters discover, I came to realize that what I was searching for wasn’t love or success or my future, I was searching for self-worth. Even after I had come so far, I still didn’t know what I was truly worth. I’m not sure why it took me over 2.5 years to finish this novel. For a long time I knew exactly what I wanted to write, only I could never make myself sit down and write it. I was stuck half way through the story, with no motivation to finish. During this hiatus, the reality I drew my inspiration from sent me through a few puke rides at a carnival. I receded to a place I didn’t want to go anymore, all the while trying to judge my own self-worth again. It took one last shovel full of mistakes before I hit rock bottom. I was finally over it. So I picked up the pen (or computer) again. This time writing with resolve instead of longing. I was able to finish it with the correct thoughts in my head, with the true meaning of beauty coursing it’s way through my veins. The plot of the book turns out the way I had always wished it had, but I struggled invariably for quite sometime on whether it should follow along with the reality it was inspired from or not. I chose to stick to the plan, purely because I felt it needed to. And like the magnificent assumption in the movie ‘Becoming Jane’, Jane Austen wrote happy endings for her characters because she would never come to one. Just because this particular ending didn’t happen didn’t mean a happy ending wasn’t deserved by the people whose lives I created on paper. I wanted to leave you with something from my book, because it’s cruel to talk about it so much and never have let you take a peak. Made this short video of a beautiful snow that fell in Nashville a few days ago. This is my first attempt at shooting and editing a video with my new camera equipment. I used this edited clip of the song as a skit in the Christmas Eve service I directed last year. When I watched the raw footage I took, I tried quite a bit of music to accompany it, aiming to use a copyright-free song from a website I frequent. I just couldn’t get away from this song though. It has such a melancholy feel to it, and yet it’s beauty shines through with an odd expression of hope. That’s the message I wanted for the video. I wanted to show the beauty of nature covered in snow, but also the desperation and loneliness that it brings. The covering of something that appears dead with something that is frozen and heavy… and somehow we call it beautiful. The destruction of ourselves truly is beautiful, because in that destruction we are able to consider hope. Hope helps us to live again.